The team at discoverygarden is pleased to announce the launch of ‘Arca’; the outcome of a successful collaboration with the British Columbia Electronic Library Network (BC ELN). Arca, which is latin for ‘treasure chest’, was built using Islandora’s open source digital repository framework to provide in-depth access to a variety of British Columbia’s post-secondary institutions digital assets and research outputs. BC ELN contracted discoverygarden to support requirements gathering and implementation of Islandora as well to managing it’s Canadian-based cloud hosting. This shared platform will allow all involved post-secondary institutions open access repositories for any digital assets they wish to make available to the wider community and will showcase British Columbia as a hub for knowledge creation across Canada and around the world. We are excited to continue working with BC ELN in support of the Arca project. For more information on Arca, feel free to explore the repository site: http://arcabc.ca. Migrate DSpace content to Islandora multi-site repository and develop shared tools to meet the needs of all consortial members, and develop separate themes to distinguish the look and feel of the five member sites. Authentication via EZproxy was another important service established in May. This was done with the assistance of Mark Jordan, Head of Library Systems at Simon Fraser University's W.A.C. Bennett Library. Being part of the Islandora community has its advantages! Lossless importation of data, functional enhancement, five coordinated but distinguishable sites. To migrate data from their existing DigiTool repository into Islandora to empower staff to further populate, curate and maintain the repository. Boston College started with our “Jumpstart” installation bundle which enabled the team at Boston College University Libraries to test the software, define how to modify the theme, receive training and clarify the customizations that would bring their repository to life. Next, the college undertook a detailed assessment project to outline the approach for migrating data from their DigiTool repository, map existing handles and create new ones, as well as modify the Islandora Video Solution Pack for streaming video. Boston College launched their new Islandora institutional repository, eScholarship@BC, in February 2015 to showcase and preserve Boston College's scholarly output in digital form and to make it freely accessible globally. Move to an open source repository platform by migrating assets from CONTENTdm to Islandora, create an attractive and intuitive user portal, and optimize site performance for high traffic load. METRO staff worked closely with us to unify the metadata profile across collections, map to MODS and create XML forms to accommodate migrated content. After populating the repository, the team turned its focus to exposing content through an attractive, easy to use portal. We created a Collection Search tool to help users discover content from METRO’s 23 collections. We also created a beautiful custom theme based on Drupal Zen, incorporating Galleria for a large visual slideshow element on the front page. While preparing to launch the site, METRO took advantage of the easy to configure Solr search and OAI-PMH settings to expose and leverage the repository’s granular MODS metadata for discovery both on the repository site and through aggregators like DPLA. The team also made performance a priority ensuring the repository could handle hundreds of concurrent users. Our DevOps team undertook benchmark testing, blocked obscure web crawlers, implemented our new Islandora Varnish module to manage caching, and updated the hosted server environment and storage type. The outcome was an almost 400% improvement in performance for its launch on May 7, 2015. Click here to read the launch announcement. The Digital Culture of Metropolitan New York (DCMNY) repository will provide online access to digital collections of libraries, archives, museums and historical societies located in and around New York City. It will serve as a hosting service for members of the Metropolitan New York Library Council to make their content available online, as well as an on-ramp to the Digital Public Library of America (DPLA). Installation of Islandora digital repository framework as well as developing a beautiful front page and banners for the institute’s new online repository. Barnard College wanted to better understand the Islandora installation process through documentation and knowledge transfer. Just months after the installation, the team had ingested digital assets and needed to prepare to launch the site. Creating an attractive front page for the website was a priority. discoverygarden provided detailed knowledge transfer sessions during the installation process as well as granular installation documentation afterward. The communication helped Barnard College adhere to an internal IT infrastructure policy requiring detailed systems information for all projects. 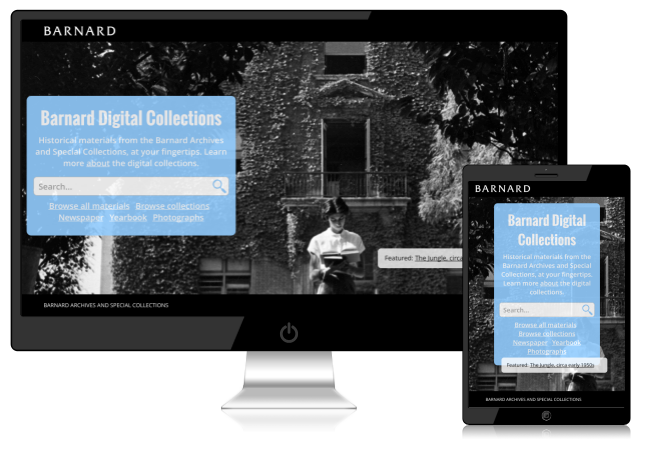 The installation allowed the digital archivist and developer at Barnard College the ability to begin populating the repository. Using custom scripts developed by Barnard’s developer and metadata forms created by the digital archivist (using the Islandora form builder), they batch ingested approximately 3000 newspaper issues and ~100 yearbooks and individually ingested ~400 photograph items over a period of six months and configured the site, moving them closer toward the repository launch. While planning the launch, the Barnard College team began dreaming up their ideal repository front page. Through wireframing and discussions with discoverygarden, the vision became a reality. We prioritized tasks and set out to create a striking theme with a beautiful and functional front page that highlights discovery tools and its newspaper, yearbook and photograph assets. Design and implement an OAIS compliant, digital repository for very high definition digital surrogates of rare archival film elements and provide free online public access to lower resolution copies of archival film and video. In 1980, the University of South Carolina received over 2,000 hours of unique film material from the Fox Movietone News Library, some of it dating back to 1919. The university began encoding this video into digital format starting in 1997 and designed a tiered storage and online access environment in 2006 but was not able to fund the realization of this environment. Fast forward to 2011, some funding was received internally to begin planning a pilot repository project which included purchasing hardware, identifying open source software and identifying a development partner. They selected Islandora as the framework upon which to build this archival video collection and discoverygarden inc to provide development and consulting services. discoverygarden reviewed the requirements and current framework within USC, provided a development environment to in the form of a virtual machine running the latest version of Islandora, developed a content and object model architecture, implemented a faceted search utilizing SOLR, developed a Drupal theme for the site, developed a management interface for adding and maintaining content, and assisted in manipulating existing metadata to fit the latest pbCore standard. The resulting repository uses Islandora core - but none of the solution packs. There are 3 video formats in this installation to help manage large video files. They are Preservation Masters, Mezzanine files and Access Variants. The Islandora installation interacts with a USC filesystem to manage the large amount of data. A subsequent phase of work included adding auto extraction of metadata from the preservation master files. USC has since added another 4,000 hours of unique material from a number of sources and was able to create individual collections within the extensible Islandora framework.